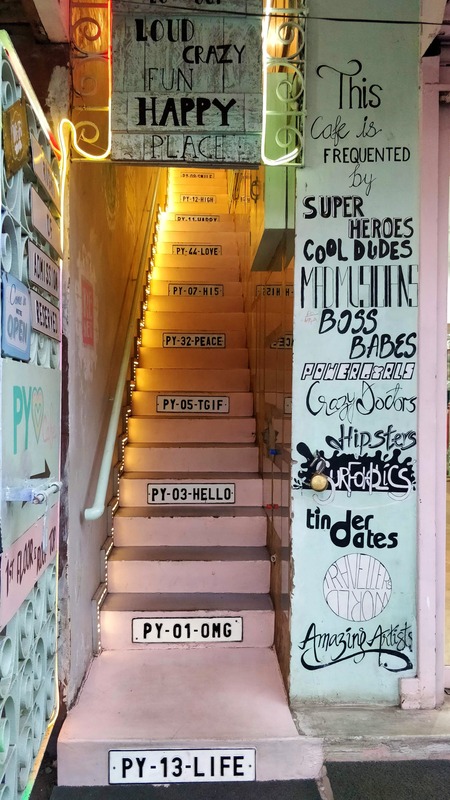 With the colourful pastel hues, quirky walls, dreamcatchers and Pinterest worthy decor, PY Cafe knows exactly how to grab your attention. Right from the lit-up staircase to the open terrace with graffiti on the walls, you will find every single corner with a unique Identity. The colours here coordinate with everything, right from your walls to the cutlery holders to the chairs and even the bill box. You will love the stairs which are loaded with mirrors as bathroom selfies are too cliched nowadays. Try taking a selfie here or maybe with one of the quotes on those colourful walls. With an elaborated menu, they have everything your tastebuds can crave for. From all-day breakfast to high tea, it's a place is perfect for every occasion. I tried their onion rings which were crispy enough to order a second plate. The coconut coated chicken marinated with beer batter was juicy to the core. The chicken Thai curry was the best one I've had to date. Not to forget, you can also make your own burgers with toppings and fillings of your choice. The staff is super friendly and courteous. They will serve you with all their love and even help you click pictures for your Insta stories. Also, they serve alcohol on weekends with live music, ladies night and DJ nights. After the sun gets down and after taking a stroll on the Paradise beach, you know where to head, to enjoy your glass of Sangria with some scrumptious food. Find Broken Clocks, Stenciled Quotes And Yummy Food At This Cafe In Pondicherry!